We have known for almost a decade that charter schools are more segregated (follow the links in this commentary) than the public schools they are replacing, and we have known much longer that diverse, inclusive classrooms are the most cost effective and just way to improve academic performance for all students. 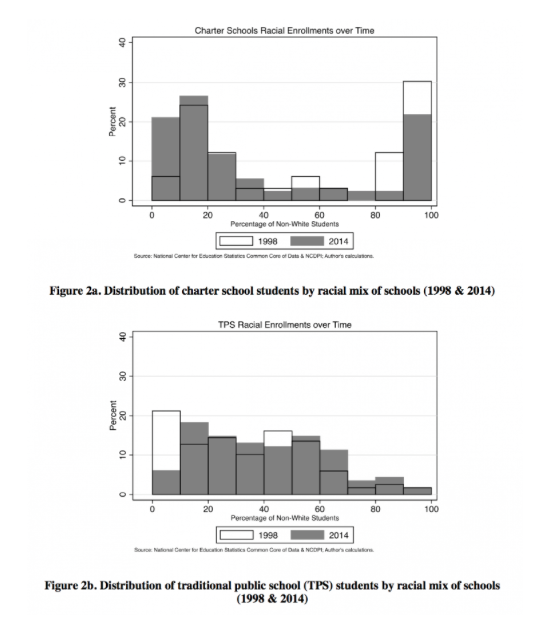 We now have evidence that charter schools have become more segregated over the past 15 years, as all minority or all white charter schools have proliferated. In North Carolina, for instance, white charters now resemble the white academies that sprang up in the wake of the 1964 Civl Rights Act, just as all black charters have become as common as they were during Jim Crow. There is a big difference, however, between the black charters of today and black public schools of the 1950s and 1960s. Even during Jim Crow, many black schools had black, caring, and professionally-trained teachers who understood the contexts of poverty and racism from which their students came. With a primary concern for the whole child, those all-black schools were not laser focused on turning children into miniature Amazon workers, who are subjected to behavioral sterilization while producing test scores that build and protect charter school brands. Another difference: today's black segregated charters are often staffed with white beginners with little, if any, professional preparation and with even less understanding of the challenges that disadvantaged children bring to school. These beginners represent the Amazon worker paradigm brought to tax-funded discriminatory schools.
. . . .Setting aside the drama between charters and teachers unions, or complaints that charter schools lead to the privatization of public education, there has been the persistent critique that charters increase inequality by plucking advantaged students out of traditional public schools. The most recent cautionary tale comes from North Carolina, where professors at Duke have traced a troubling trend of resegregation since the first charters opened in 1997. They contend that North Carolina’s charter schools have become a way for white parents to secede from the public school system, as they once did to escape racial integration orders. "They appear pretty clearly to be a way for white students to get out of more racially integrated schools,” said economics professor Helen Ladd, one of the authors of the draft report released Monday. The bottom chart shows students that attend North Carolina’s regular public schools. There is a healthy variety of schools with different racial makeups. Only about 30 percent of students attend schools that are highly segregated, meaning schools that are more than 80 percent or less than 20 percent white. The top chart shows students at North Carolina’s charter schools. More than two thirds attend schools that are highly segregated. You can see on the chart because the histogram has two humps, one at each racial extreme. The charts also show how racial makeups have shifted over time. By 2014, a fifth of charter schools were overwhelmingly — more than 90 percent — white. In 1998, less than 10 percent of charters were that way. Parental preferences are part of the problem. The charter school admissions process is itself race-blind: Schools that are too popular conduct lotteries between their applicants. But if a school isn’t white enough, white parents simply won’t apply. In previous research, Ladd discovered that white North Carolina parents prefer schools that are less than 20 percent black. This makes it hard to have racially balanced charter schools in a state where more than a quarter of schoolchildren are black. Looking at students in grades 4-8, the researchers found that the regular public school population in North Carolina has become less white over the past 15 years (from 64.1 percent white to 53 percent white), while the charter school population has grown more white (from 58.5 percent white to 62.2 percent white). Not only that, but the kids choosing charter schools these days also seem to be more able. The researchers examined how students had been scoring on standardized tests before they entered charter school. It used to be that kids with below average test scores applied to charter schools. But in recent years, the kids going into charter schools tend to have above-average test scores. The researchers argue that this changing mix of students explains much of the test score gains among North Carolina’s charter schools. By their calculations, the schools haven’t gotten that much better at teaching students — but they have gotten better at attracting more able students. In 2010, North Carolina received a $400 million Race to the Top grant from the Obama administration. As part of its application, it promised to eliminated the cap on charter schools, which had been stuck at 100. Now there has been a flood of charter schools seeking to open in North Carolina, and the researchers warn that the segregation problem might only get worse. One problem is that disadvantaged students have less of a chance to attend a charter school. First, they or their parents have to be plugged in enough to know which are the good charter schools and motivated enough to apply. Then, they need to have the resources to actually attend the charter, because unlike regular public schools, charter schools in North Carolina do not have to offer transportation or lunch to students. For poor students who rely on school buses and free meal programs, the costs associated with attending a charter school may discourage them from the opportunity. By contrast, affluent families might not think twice about driving their children to attend the high-achieving charter across town instead of a low-achieving neighborhood school. In this manner, even charter schools without explicit fees or admissions requirements may tilt toward inequality. Ladd said that she would like to see charter schools be required to provide services on a par with what public schools offer. This would be a step toward making them more accessible. The board that oversees charter schools might also be more careful about approving new ones. Schools that plan to open in white or affluent neighborhoods are unlikely to attract anyone but white and affluent students. . . .